The Comfort Revolution Memory Foam Topper Cover is a 85 gram woven 100% polyester Microfiber cover. It has a double poly satin cord, with a 120 gram one way stretch knit skirt to accommodate up to a 16” Mattress, with a 3/8” elastic band sewn in to anchor the cover in place. This cover is engineered to work with Memory Foam Toppers from 1.5” to 4” Thick, and is easily removable and machine washable. - King: 78" x 80"
The Twin Size Memory Foam Topper Cover F05-00012-TW0 has many exciting features for users of all types. 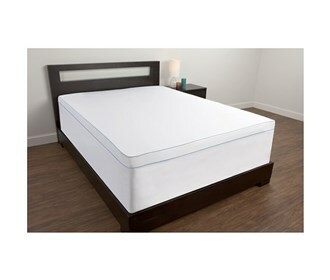 The Twin Size Memory Foam Topper Cover F05-00012-TW0 is sold as a Brand New Unopened Item.